In Papua New Guinea and the wider Pacific Islands, our art, culture an heritage is the fabric of our societies. We indigenous people of these islands live in natural environments that provides us with our livelihood. Land and sea are very important to us. 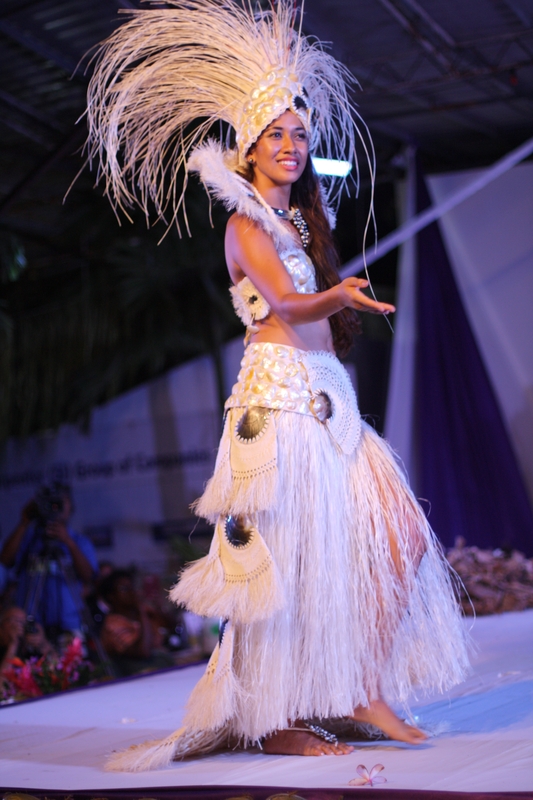 Pictured is Teuira Napa, former Miss Cook Islands and Miss South Pacific in her traditional dress, designed by her mother Tarani Napa and made by her team. “I grew up on the island of Penrhyn (Tongareva) in the Northern Cook Islands. I grew up weaving fans with my grandmother. It is a tradition that all girls have to learn to weave. At 15 years of age I had to leave to go to college on the main island Rarotonga. Because of my culture and passion for woven art I was inspired to create a dress incorporating these beautiful works of art cleverly woven by the women from my home island”. Tarani Napa, in her forties recalls what inspired her to make her daughter Teuira Napa’s stunning dress for the Miss South Pacific Quest. On the crowning night in December, Teuira stunned the crowd in Honiara, Solomon Islands when she approached the stage initially covered in ball of dried banana leaves. Then, she peeled the leaves back, and stepped out and on to the stage revealing an almost pure white breath-taking garment of intricately woven coconut fibre and black pearls. From the distance it looked like a beautiful silk taffeta until she walked up closer. We were stunned to see that the dress was made of hand fans, all elegantly placed and sewn together. Yes, thank you for commenting. A beautiful girl and magnificent dress! Yes, she is stunning! Her mother made this for her. So many hours of weaving and threading and keeping all those mother of shells together – painfully intricate. Hey Joyce, You can sow to? Wow didn’t know you could.